Bathing or showering is a routine of washing or emerging of the body in water with a purpose of maintaining personal hygiene, performing a therapeutic procedure for healing, relaxation or as a ritual. As a personal hygiene procedure, it helps to prevent the spread of diseases and keep the body clean of toxin deposits which may include environmental pollutants such as dirt and soil. Although frequent bathing or showering may seem like a logical choice, there are some drawbacks to consider. The skin is one of the largest organs in human body. It serves as a protective barrier against any invading toxins, microorganisms and environmental humidity and temperature fluctuations. Just like any other organ, the skin needs a regular care to maintain its health, functions and quality of appearance. However, too much showering or bathing may eventually disturb the natural processes occurring in the skin. Disturbed skin flora translates to a damaged protective barrier, which may be harmful not just to the skin, but to the entire body. Removal of protective oils and altering the bacterial flora predisposes the skin to being affected by environmental hazards such as toxins and microorganism that cause infections and irritate skin. Using skin maintenance products that contain parabens and/or xenoestrogens on a daily basis, significantly increases the risk of cancers related to elevated estrogen levels. Skin care products, including moisturizing creams can present intoxication threats. Since chemicals are easily absorbed into the blood stream via skin, these compounds are capable of disrupting vital body functions. Xenoestrogens are synthetic or natural compounds that mimic natural estrogen and significantly increase the risk of breast, ovarian, prostate cancers and gynecomastia. The above are only a few commonly used compounds that are known to be dangerous. An array of chemicals being added during the manufacturing process of new products is increasing. These chemicals are often being added without an adequate research on the effects on human health. Frequent showering and bathing increases intoxication with dangerous chemical additives that are absorbed into the bloodstream via skin. Fluoride water treatment – water fluoridation is actively used throughout the Unites States, United Kingdom, Australia, Canada, Ireland and several other countries. Fluoride is added to water supplies in attempt to improve dental health, however, long term exposure to this toxin is extremely dangerous. For this reason, many countries has stopped utilization of fluoride water treatment such as Federal Republic of Germany, Russia, Ukraine, Sweden, Netherlands, Finland, Japan, German Democratic Republic, Czechoslovakia and a others. Chlorine disinfection – used to disinfect water and reduce the risk of microbial contamination by bacteria or viruses. Disinfection byproducts such as THMs and HAAs are over 10,000 times more toxic than chlorine. 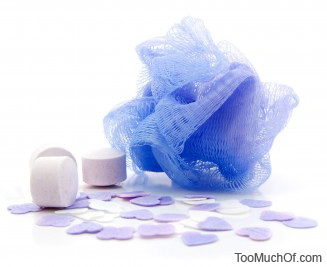 These disinfection byproducts have been linked to reproductive, bladder and rectal cancers. It is important to note that any compounds left on your skin after a shower when your skin pores are open and lipids are washed away, ends up in your bloodstream. Always think about what you put on your skin!